Wave7: Apple iPhone sales ride Sprint's BOGO to score strong June rebound in U.S. 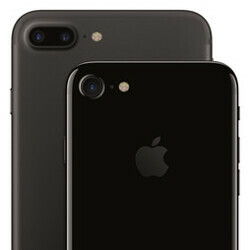 According to analytical firm Wave7, Sprint's BOGO promotion on leased Apple iPhone 7 and Apple iPhone 7 Plus units have helped Apple score a strong June in U.S. sales. Apple's chief rival, Samsung, benefited from a strong start for the Samsung Galaxy S8 and Samsung Galaxy S8+. The latter two handsets were the subject of a T-Mobile BOGO, but sales of the previous generation models (Samsung Galaxy S7 and Samsung Galaxy S7 edge) have dried up to the point that Samsung's sales at physical retail locations in the states have been negatively affected. Wave7 analyst Jeffrey Moore notes that Samsung's market share in the U.S. is slipping. The Galaxy S7 and Galaxy S7 edge are quickly disappearing, and unlike the sales picture after they were originally launched, the Galaxy S8 is now outselling the Galaxy S8+. Moore says that he has heard very positive feedback from Sprint reps about how the carrier's BOGO deal on the iPhone 7 series is positively affecting sales of the handsets. The bottom line is that Apple's share in the U.S. is bouncing higher. Samsung has been slipping because people are seeing the truth. The S8 is just another example of laggy Samsung phones. Unfortunate. Laggy!!! You seem to be in an age "S3"
He doesn't need to dream, he posted the citation. I guess ios crash-test dummies are incapable of coming up with responses that refute the facts. Here we go again with you considering your opinion as the truth. When will you grow up? hes a clown. Momma said don’t be be talking to clowns. So why are you talking to yourself? He wants to bait someone into a flame war. I've figured him out now. Correction: Darkkmite thinks I'm trying to bait her into a flame war. No darkkmite, you haven't figured anything out. You're just mad because I won't get on all four and kiss your rear. You're just mad because I won't stop putting your lapdog meanest in his place. You're just mad because I'm more vocal about the stuff you and the other knuckledraggers refuse to acknowledge. I will say what I have to say when I want to say however I want to say it and there's nothing you can do to shut me up. Do us a favor and just go marry the S8 or the Bloat 8 just so you can stop with the drooling over it. I told you I wasn't going to let up. I warned you not to provoke me. You're just an idiot trying to bait someone into a flame war. Darkk is correct. And you're seething with anger because he knows how much of a troll you really are. He broke you're heart and you've never gotten over it. Lol, you couldn't put me in my place if I sat still for you. I constantly sends you scurrying away like the cowardly keyboard warrior that you are. In other words, you troll what you don't like or agree with, ands you don't offer anything of substance on any article that you comment on. Do us all a favor and deactivate this account like you did your mxyzptlk and Tony_Stark accounts. Lol, you act like what you do on a tech site can actually hurt darkk. You're too much of a coward to anything like this to anyones face. He showed us no mercy lol. He will never let up. His mercy has limits...we exceeded those limits lol. He really has no idea how ridiculous he looks acting this way, lol. He really thinks he's affecting us, with the effect of his showing us no mercy lol. Dude, that's what makes it so damn funny. You can clear as day tell how pissed off he was. If you touched his arm, your finger would blister from the heat. On the contrary, I'm actually quite calm, Darkkmite. You're the one who's triggered. Go back to your BlackBerry articles. Oh wait, you kept getting buried by me, so you needed darkkmite to help you lol. Lol, changing the facts around to suit your false narrative won't negate the truth. Especially since me dragging you all around BlackBerry articles is in digital ink for all to see. Oh look, here comes the butthurt lapdog. Darkkmite didn't break anything. He just realized I wasn't going to get on all fours like you're doing right now and it's hilarious. You wish. You're like a cockroach that I have to constantly step on and remind you who is boss. Still can't get over the fact that I'm always keeping it real? You're the one who constantly trolls and attack anyone on BlackBerry articles just because you don't like what they say. Why don't you make me. You're the last person to call anyone a coward since you get scared every time I call you out. Lol, darkk broke your inbred trolling Apple shill heart, and now you've been triggered to attack him no matter where or when he posts a comment. It's so funny to see you running around here seething with anger and jealousy like some broken hearted stalker. You're projecting. Now let's be real: You don't keep sht real. You troll stuff they you don't like or agree with incessantly. You attack and troll anyone that doesn't say what you agree with, as if your opinion is fact. Lmao! Triggered cowardly keyboard warrior at it again. We both know you only talk crap from behind the safety of mommy and daddy's computer in the basement. Lol, you're projecting again. Oh boy, now he's not gonna show you any mercy lol. You've provoked Battynomercymxyflashmit, and will feel his wrath. Lmao! He's triggered beyond belief. I can feel the heat of anger jumping off of him through my tablet screen.